A volcano is a mountain that opens downward to a pool of molten rock below the surface of the earth. When pressure builds up, eruptions occur. Gases and rock shoot up through the opening and spill over or fill the air with lava fragments. Eruptions can cause lateral blasts, lava flows, hot ash flows, mudslides, avalanches, falling ash and floods. Volcano eruptions have been known to knock down entire forests. An erupting volcano can trigger tsunamis, flashfloods, earthquakes, mudflows and rockfalls. More than 80 percent of the earth's surface is volcanic in origin. The sea floor and some mountains were formed by countless volcanic eruptions. Gaseous emissions from volcano formed the earth's atmosphere. The word volcano comes from the little island of Vulcano in the Mediterranean Sea off Sicily. Centuries ago, the people living in this area believed that Vulcano was the chimney of the forge of Vulcan( Lat. Volcanus)--the blacksmith of the Roman gods. They thought that the hot lava fragments and clouds of dust erupting from Vulcano came from Vulcan's forge as he beat out thunderbolts for Jupiter, king of the gods, and weapons for Mars, the god of war. 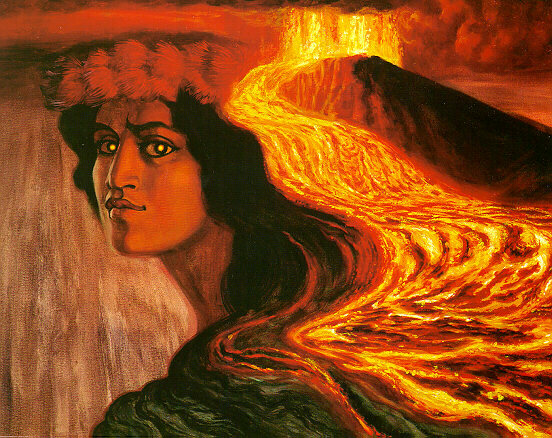 In Hawaii the people attributed eruptive activity to the beautiful but wrathful Pele, Goddess of Volcanoes, whenever she was angry or spiteful. This cross-section shows the parts of a volcano. A conduit feeds magma to the surface. Near the surface, the gas expands and fragments the lava into ash. Some magma passes through dikes to feed vents. Some magma intrudes parallel to layers to make sills. 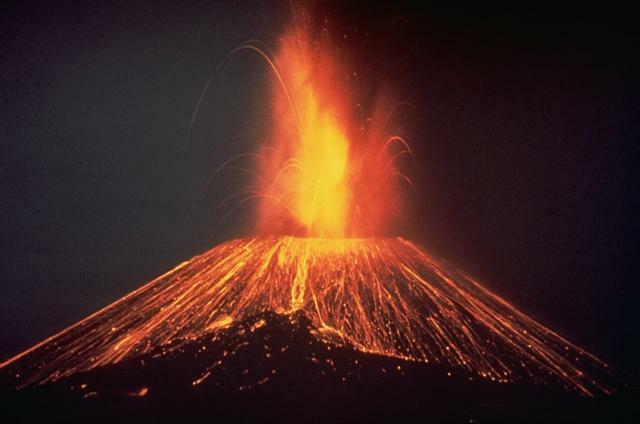 More than 500 volcanoes are known to have erupted on the earth’s surface since historic times, and many more have erupted on the ocean floor unobserved by humans. Fifty volcanoes have erupted in the United States, which ranks third, behind Indonesia and Japan, in the number of historically active volcanoes. Of the world’s active volcanoes, more than half are found around the perimeter of the Pacific, about a third on midoceanic islands and in an arc along the south of the Indonesian islands, and about a tenth in the Mediterranean area, Africa, and Asia Minor. The top part of Earth's mantle (called the asthenosphere) contains concentrations of heavy, radioactive elements such as uranium and thorium. These isotopes decay over geologic time into lighter, more stable elements. 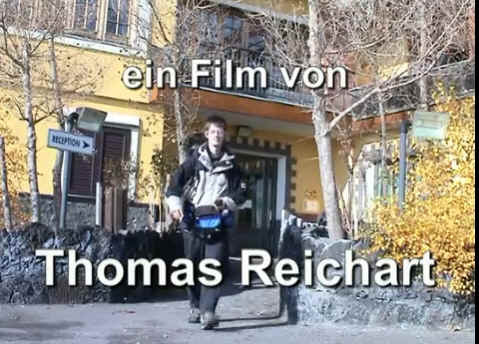 With this transformation, a large amount of energy is released to the surroundings, raising the temperature. For billions of years, this heat energy has been gradually moving from this zone to the cooler crust. 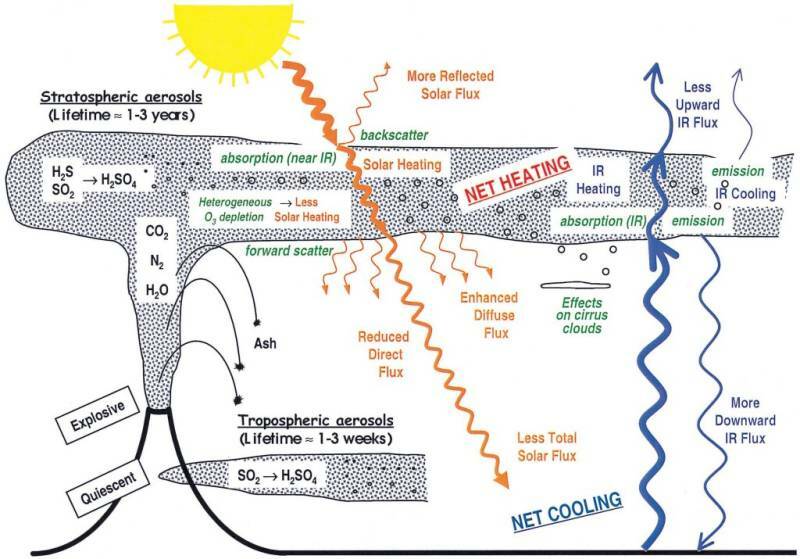 The general transportation mechanism of this heat includes super-heated water, gas venting, and liquid rock and ash extrusion through the surface, termed volcanism. Places on the Earth where this occurs are called volcanoes, and their characteristics vary, depending on size, type, location, and activity. Active volcanoes today exist in the cold Antarctic, under the surface of the Pacific Ocean, on tropical islands, and in desolate deserts. Some emit steam and searing-hot noxious gases, some eject choking and blinding, sunlight-blocking ash; others liquid rock called lava. Many exhibit a combination of these. Geologists generally group volcanoes into four main kinds--cinder cones, composite volcanoes, shield volcanoes, and lava domes. Cinder cones are the simplest type of volcano. They are built from particles and blobs of congealed lava ejected from a single vent. As the gas-charged lava is blown violently into the air, it breaks into small fragments that solidify and fall as cinders around the vent to form a circular or oval cone. Most cinder cones have a bowl-shaped crater at the summit and rarely rise more than a thousand feet or so above their surroundings. Cinder cones are numerous in western North America as well as throughout other volcanic terrains of the world. Composite volcanoes Some of the Earth's grandest mountains are composite volcanoes--sometimes called stratovolcanoes. They are typically steep-sided, symmetrical cones of large dimension built of alternating layers of lava flows, volcanic ash, cinders, blocks, and bombs and may rise as much as 8,000 feet above their bases. Some of the most conspicuous and beautiful mountains in the world are composite volcanoes, including Mount Fuji in Japan, Mount Cotopaxi in Ecuador, Mount Shasta in California, Mount Hood in Oregon, and Mount St. Helens and Mount Rainier in Washington. Most composite volcanoes have a crater at the summit which contains a central vent or a clustered group of vents. Lavas either flow through breaks in the crater wall or issue from fissures on the flanks of the cone. Lava, solidified within the fissures, forms dikes that act as ribs which greatly strengthen the cone. 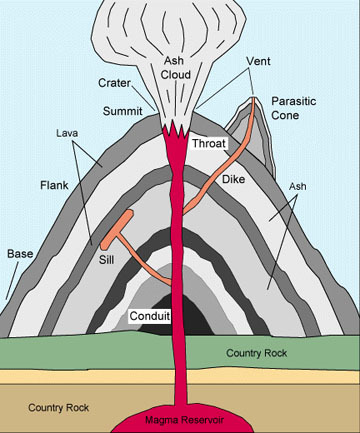 The essential feature of a composite volcano is a conduit system through which magma from a reservoir deep in the Earth's crust rises to the surface. The volcano is built up by the accumulation of material erupted through the conduit and increases in size as lava, cinders, ash, etc., are added to its slopes. When a composite volcano becomes dormant, erosion begins to destroy the cone. As the cone is stripped away, the hardened magma filling the conduit (the volcanic plug) and fissures (the dikes) becomes exposed, and it too is slowly reduced by erosion. Finally, all that remains is the plug and dike complex projecting above the land surface--a telltale remnant of the vanished volcano. Shield volcanoes, the third type of volcano, are built almost entirely of fluid lava flows. Flow after flow pours out in all directions from a central summit vent, or group of vents, building a broad, gently sloping cone of flat, domical shape, with a profile much like that of a warrior's shield. They are built up slowly by the accretion of thousands of highly fluid lava flows called basalt lava that spread widely over great distances, and then cool as thin, gently dipping sheets. Lavas also commonly erupt from vents along fractures (rift zones) that develop on the flanks of the cone. Some of the largest volcanoes in the world are shield volcanoes. In northern California and Oregon, many shield volcanoes have diameters of 3 or 4 miles and heights of 1,500 to 2,000 feet. The Hawaiian Islands are composed of linear chains of these volcanoes including Kilauea and Mauna Loa on the island of Hawaii-- two of the world's most active volcanoes. The floor of the ocean is more than 15,000 feet deep at the bases of the islands. As Mauna Loa, the largest of the shield volcanoes (and also the world's largest active volcano), projects 13,677 feet above sea level, its top is over 28,000 feet above the deep ocean floor. In some eruptions, basaltic lava pours out quietly from long fissures instead of central vents and floods the surrounding countryside with lava flow upon lava flow, forming broad plateaus. Lava plateaus of this type can be seen in Iceland, southeastern Washington, eastern Oregon, and southern Idaho. Along the Snake River in Idaho, and the Columbia River in Washington and Oregon, these lava flows are beautifully exposed and measure more than a mile in total thickness. Volcanic or lava domes are formed by relatively small, bulbous masses of lava too viscous to flow any great distance; consequently, on extrusion, the lava piles over and around its vent. A dome grows largely by expansion from within. As it grows its outer surface cools and hardens, then shatters, spilling loose fragments down its sides. Some domes form craggy knobs or spines over the volcanic vent, whereas others form short, steep-sided lava flows known as "coulees." Volcanic domes commonly occur within the craters or on the flanks of large composite volcanoes. The nearly circular Novarupta Dome that formed during the 1912 eruption of Katmai Volcano, Alaska, measures 800 feet across and 200 feet high. The internal structure of this dome--defined by layering of lava fanning upward and outward from the center--indicates that it grew largely by expansion from within. Mont Pelée in Martinique, Lesser Antilles, and Lassen Peak and Mono domes in California are examples of lava domes. 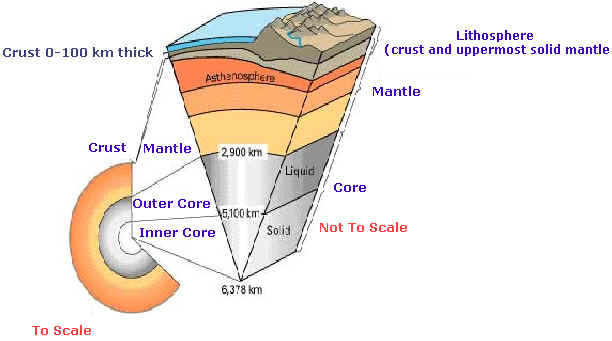 Deep inside Earth, between the molten iron core and the thin crust at the surface, there is a solid body of rock called the mantle. When rock from the mantle melts, moves to the surface through the crust, and releases pent-up gases, volcanoes erupt. Extremely high temperature and pressure cause the rock to melt and become liquid rock or magma. When a large body of magma has formed, it rises through the denser rock layers toward Earth's surface. Magma that has reached the surface is called lava. Magma comes in different compositions. Each of these will produce a different lava, from fluid, fast-moving basalt to slower, more viscous andesite. Because rocks are made up of collections of minerals that melt at different temperatures, the makeup of the rock being melted affects the magma that results. Volcanic eruptions are thought to be responsible for the global cooling that has been observed for a few years after a major eruption. The amount and global extent of the cooling depend on the force of the eruption and, possibly, its latitude. When large masses of gases from the eruption reach the stratosphere, they can produce a large, widespread cooling effect. A volcanic winter is the reduction in temperature caused by volcanic ash and droplets of sulfuric acid obscuring the sun, usually following a volcanic eruption. A paper written by Benjamin Franklin in 1783 blamed the unusually cool summer of 1783 on volcanic dust coming from Iceland, where the eruption of Laki volcano had released enormous amounts of sulfur dioxide, resulting in the death of much of the island's livestock and a catastrophic famine which killed a quarter of the population. Temperatures in the northern hemisphere dropped by about 1 °C in the year following the Laki eruption. Known as the “year without a summer,” the summer of 1816, unexpected climate changes left countries in the Northern Hemisphere suffering from devastating famine and epidemic outbreaks. These weather patterns were the result of the volcanic eruption of Mount Tambora in Sumbawa, Indonesia, on 10th April 1815. It snowed in June in the United States and Europe. Crops failed, there was starvation, people lost their farms, and it touched off the wave of emigration that led to the settlement of what is now the American Midwest. In the meantime, hundreds of thousands more starved around the world. New England and Europe were hit exceptionally hard. Snowfalls and frost occurred in June, July and August and all but the hardiest grains were destroyed. Destruction of the corn crop forced farmers to slaughter their animals. Soup kitchens were opened to feed the hungry. Sea ice migrated across Atlantic shipping lanes, and alpine glaciers advanced down mountain slopes to exceptionally low elevations. In 1991 explosion of Mount Pinatubo, another stratovolcano in the Philippines, cooled global temperatures for about 2–3 years, interrupting the trend of global warming which had been evident since about 1970. 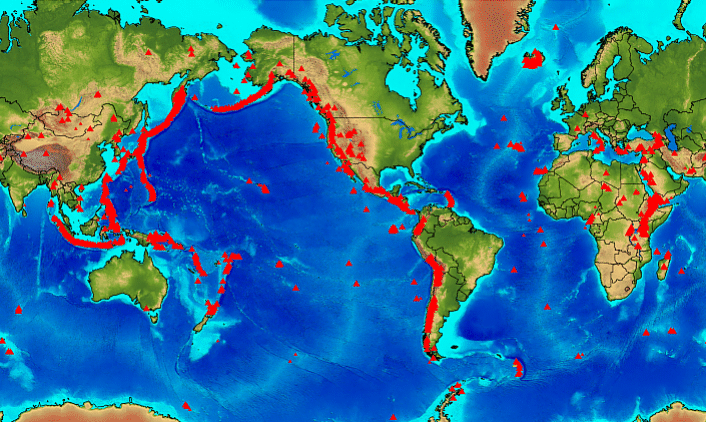 The more than 500 active volcanoes erupting around the world affect the Earth's atmosphere and global climate. As volcanoes erupt, they blast large clouds of gases, particles, water vapor, and aerosols into the atmosphere. Another possible effect of a volcanic eruption is the destruction of stratospheric ozone. Researchers now are suggesting that ice particles containing sulfuric acid from volcanic emissions may contribute to ozone loss. When chlorine compounds resulting from the breakup of chlorofluorocarbons (CFCs) in the stratosphere are present, the sulfate particles may serve to convert them into more active forms that may cause more rapid ozone depletion.